Source: Advance copy sent over by Sam Eades from Headline Book Publishing. Thanks! Synopsis: A mother and her daughters drive for days without sleep until they crash their car in rural Oklahoma. The mother, Amaranth, is desperate to get away from someone she’s convinced will follow them wherever they go–her husband. The girls, Amity and Sorrow, can’t imagine what the world holds outside their father’s polygamous compound. Rescue comes in the unlikely form of Bradley, a farmer grieving the loss of his wife. At first unwelcoming to these strange, prayerful women, Bradley’s abiding tolerance gets the best of him, and they become a new kind of family. An unforgettable story of belief and redemption, AMITY & SORROW is about the influence of community and learning to stand on your own. I read a lot on the bus and in the bath… as a matter of fact, that’s where most of my reading gets done. I fall asleep when I try to read in bed or on the couch so while commuting or relaxing in a tub of suds seems to do the trick for me. Let me tell you, the amount of times I almost missed my stop or how often my bathwater went icy cold was pretty much a constant. I loved Amity & Sorrow and it’s easily one of my favourite books of the year so far. There’s loads that I liked about this novel from the setting and descriptions on down to the dialogue but one of the main things that fascinated me the most about Amity & Sorrow were the characters. I found myself not liking Amaranth at first but as she began to grow away from her past I got on board with her a bit more. She reminded me a lot of my mother at first which was disheartening to say the least. Amity and Dust were fantastic, innocent characters you couldn’t help but like and enjoy. And there’s Sorrow, a force to be reckoned with. I had kind of clocked what was going on with Sorrow from a few pages in, the issues she was having (sorry, no spoilers! ), but not to quite the extent I’d expected. Goodness, that sounds so obtuse but I really don’t want to ruin it because it’s so good! I wanted to feel sorry for Sorrow, for what she’d been through. I wanted to empathise with her pain, her loss. But you know what? I couldn’t. I detested her. I hated her selfishness, her willingness to damn everyone else to hell without a second thought. There was just something about her that just kept me from feeling any sort of emotion towards her other than anger. Riley has created a strong character in Sorrow. One other thing I wanted to touch on was Riley’s creation of a whole world, a religious cult, which was so believable that it was scary. I’m sure groups like this do exist, living polygamous lives off the grid; you hear about them all the time on the news. Riley has also meshed in some of the creepier elements of David Koresh and Warren Jeffs in Zachariah who I imagine to be a very charismatic individual… particularly if he managed to bring in 50 wives. Amity & Sorrow was a wild ride through the mid-west, through drought stricken fields, dusty towns and abandoned service stations. It was like spinning, spinning until you’re so dizzy you feel like you might just float away. And I don’t like spoilers in reviews but WHOAH that ending… man oh man is it good! Do yourself a favour over the Easter holidays… go pick up a copy of Amity & Sorrow and read it. You won’t regret it. 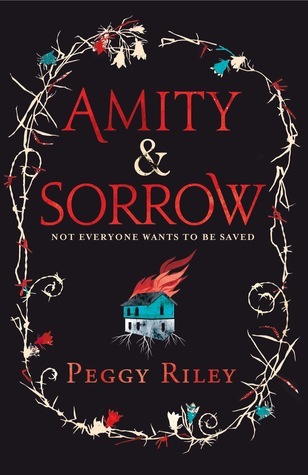 You can purchase Amity & Sorrow both in the UK and US on Amazon or at any number of fantastic booksellers. Great review. I can’t wait to read this! It really was amazing! I can’t wait to see what other people think! Ooh, I love a good fundamentalist cult novel (a la ‘The 19th Wife’)! Just might have to pick this one up! Oh man, it’s so good. BTW, I have an invite to the book launch on the 28th… if you wanna be my +1 hee hee.